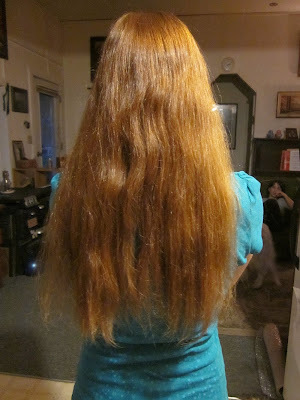 Last September, Younger Daughter cut her hair and donated the resulting ponytail to Locks of Love. This is the second time she's donated her hair. 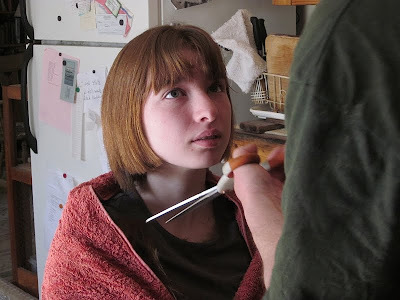 Older Daughter had wanted to cut her hair again as well (she also has donated once) but back in September it was still a bit too short for donation, so we waited until now. Last Monday was the big day! 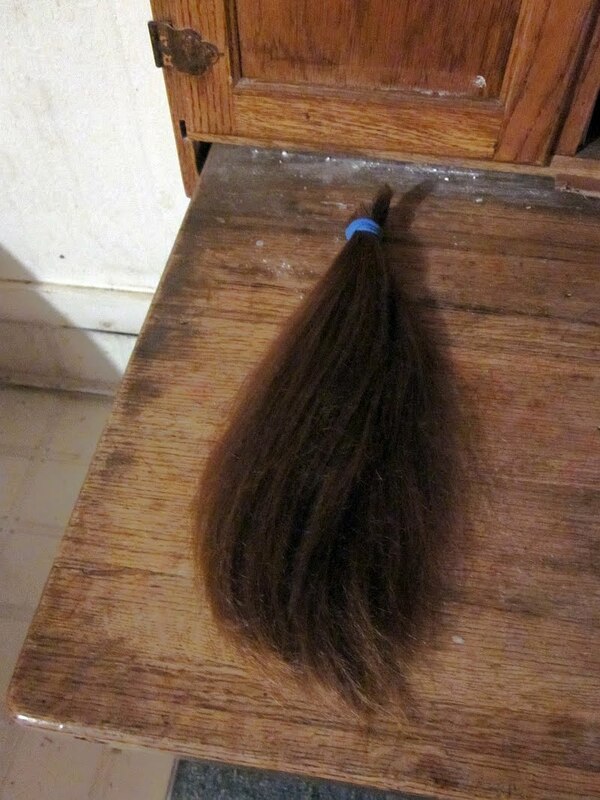 Length from the band: twelve inches, more than enough to donate. The big moment. It's always hard on me to cut the girls' hair because I love long hair. But hey, it's their choice. 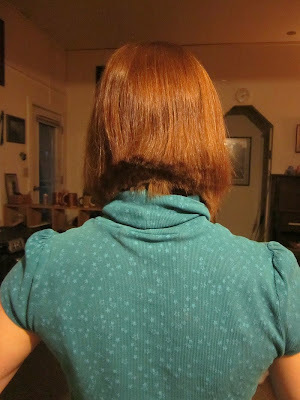 Here's the disembodied ponytail, always a weird sight. The next morning (when the light was better), Don did some evening up on her hair. He's much better at this sort of thing than I am. We've decided her new haircut resembles the 1920s "flapper" look -- very flattering. I love me some redundant feller. I surely do. It's no wonder you're so stuck on him. And that is one gorgeous daughter....intelligent, generous, beautiful....just like her parents. That is a great blessing for someone to donate their hair. My daughter has done it twice so far. She was motivated by her cousin who was diagnosed and died early from cancer. More people should be made aware of this so more wigs can be made for the unfortunate. Thank you so much for sharing this story. Plus the cut looks so cute on her! Your daugther is beautiful, and I love the fact that she decided to donate her hair to the Locks of Love. Very pretty girl, beautiful heart! Adorable cut. Very sweet and loving act she did. You are blessed. Aww, what sweet daughters you have, Mama is doing something right!! Beautiful daughter - inside and out! Wigsforkids.org provides wigs for kids with cancer. Locks of love is for children with alopecia. Locks of Love throws out 80% of the hair donated. Locks of Love was started as a for-profit and only later switched to non-profit. Wigs for kids has been non-profit from day one. Glad your daughters want to donate, next time consider Wigs for Kids. 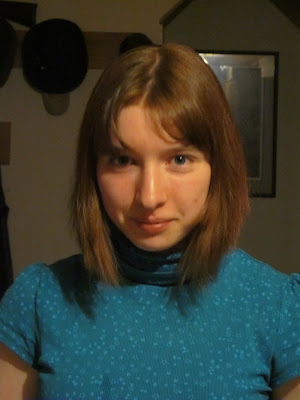 I, too, really like long hair, but that cute hair cut really makes those big beautiful eyes stand out. Perhaps, it is from being so selfless and giving. I have donated my hair several times. 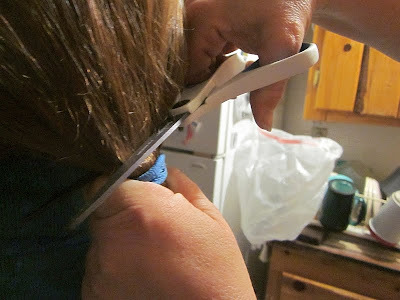 The local beauticians will will cut it simply for free (no bang trims). One thing they do is pull it in a pony tail and then place several bands the length of the hair. Then the remove the top band and make the cut. MUCH less evening on is done aka hair loss. The top band is then replaced to the cut hair length. You dont get the high place in the center that you get by cutting right above the band. It is awesome your dd give of themselves in this way. Looks like Don is handy with the shears. I can see while mom is scissor happy, the girls hair would definitely look better if mom deferred the initial hair cutting to him. 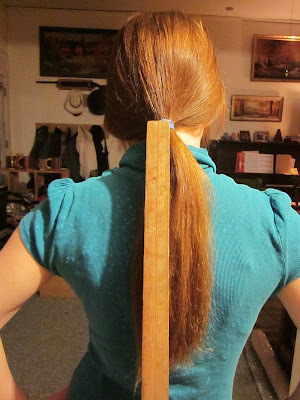 You get a much neater starting point for finishing up if you make at least four ponytails and then hold them still, cut the outer half and then inner half. 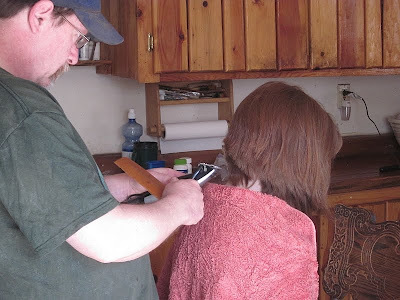 My boyfriend cuts my hair and taught me how to cut my children's hair as well. Better than I ever got in the salon. Like you I like long hair, so does my boyfriend so there is not big chop in my future.